Play and Learn with Miffy welcomes Laddu. Laddu is a cute little rhesus monkey. 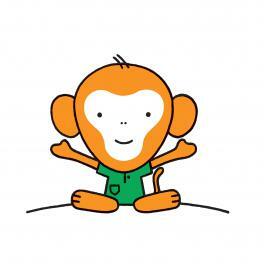 Rhesus monkeys are smart and good at mimicking; we can't wait to see laddu’s tricks, when he grows up. Laddu means sweet and has two meanings, it is a sweet which you can eat during a celebration and it's a sweet name for young children. Dulara is his last name and it means someone who is close to your heart and lovable. It also means "apple of the eye" or "blue eyed boy/girl". It all suits the sweet little monkey very well. In the first book, we read about Laddu’s birth. The book has been distributed in the flood affected areas in Pakistan. Alongside the book, an early child development tool was developed, specifically focusing on personal hygiene. A song guides children and parents through the different steps of keeping yourself clean – Aao naa, gaao naa Apnay tum haathaun ko Dho O na!